Last night I had the opportunity to attend a Mixology 101 class offered by H. Joseph Ehrmann's Cocktail Ambassadors. 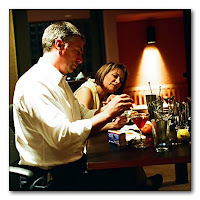 Cocktail Ambassadors offers a range of courses that explore basic bartending, mixology, fresh market cocktails and even seasonal, holiday cocktails. They can also develop specific courses to address specific needs for corporate meetings or promotional events. H explores the difference between a shaken and a stirred Manhattan. We learned how to use all of the basic bartenders tools through the hands-on creation of several different cocktail recipes. 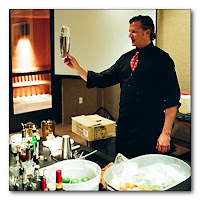 H also covered techniques that take the home bartender to a higher level of professionalism and skill. H explains the proper use of the Boston Shaker. While we were practicing our skills and making cocktails, H kept us entertained with anecdotes and interesting bits of cocktail history. 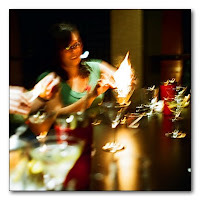 A Mixology 101 student practices the art of "flaming" an orange peel. We prepared several different cocktail recipes and explored variations on each recipe. H was able to answer questions and offer individual instruction to each student. Participants using their new mixological skills. 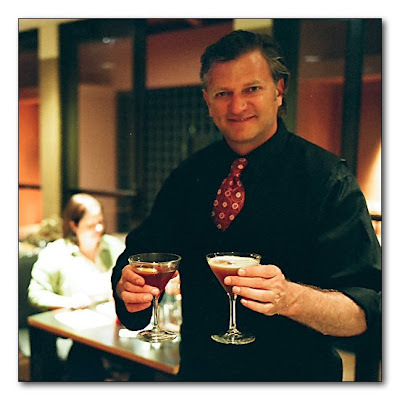 I think the courses are suitable for bartenders and aspiring bartenders of all levels. Even as a professional bartender, I found the class entertaining and interesting. Everyone in the class was having a great time. There is an on-going series of events scheduled in the San Francisco Bay area this summer. The Cocktail Ambassadors website has a complete schedule. If you need to set up your home bar, plan a corporate event, or just tune-up your bartending skills, contact H at Cocktail Ambassadors to set up a custom program for you. nice photos and a great recap.